Tammie Alvarado of Tulare, Calif., shows how to make this wedding nail art. Tammie Alvarado (@tntalvarado316) of Tulare, Calif., shows how to make this wedding nail art. 2. 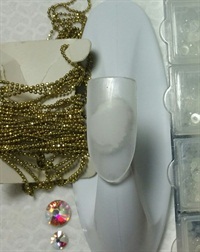 Add a layer of gel to adhere crystals in the center of the nail starting with the largest then add ball chain around the stone. Repeat for other stone. 3. 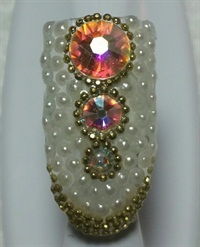 Add chain over the areas not covered with crystals. 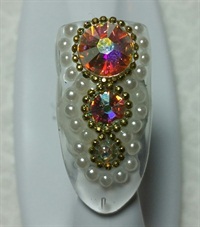 Use that uncured layer to add pearls, covering the rest of the nail. Cure.